RoughNotes Digital Corporate product product videos page - The Rough Notes Company Inc. Rough Notes Solutions: An effective video marketing approach to grow your business. Creates custom videos that will transform how your business captures and engages visitors with relevant content, quickly giving access to the information needed. This approach can increase your potential to turn prospects into customers. Is a turnkey video production solution that creates a compelling digital experience from idea conception throughout the completion process—including integration with your website and social media sites. Marketing your business today needs to be a digital experience. You need a different approach to how you engage customers and prospects. You need to respond to your customers’ desire for a completely different experience—one where they can access videos anytime, anywhere, on any device. The use of videos can help you gather additional information and data on consumer behavior. In addition, major search engines have moved video content to the top of their search parameters. Are you able to produce and deliver relevant content through use of videos? Are you gaining traction in social media marketing through use of digital videos to grow your business? If you answered no to either of these questions, then contact us today! Write scripts targeted to your specific demographics. Shoot and edit videos that are relevant and easy for your prospects and customers to understand. 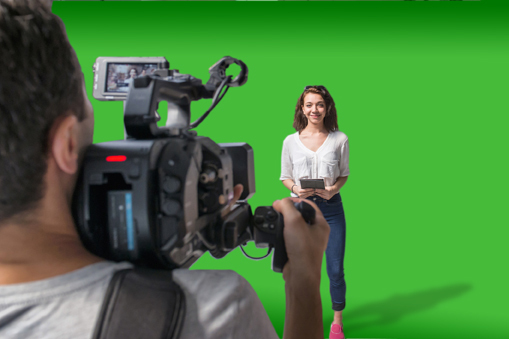 Tell stories professionally in all types of video production, including green-screen studio production and other creative studio approaches. Provide actors who are used for sales, marketing, training, or quickly onboarding new professionals into the insurance industry. Produce excellent customer testimonials on videos to showcase on your website. Video testimonials are the gold standard, second only to actual word of mouth from a friend or family member. Carriers and large enterprise companies can use Rough Notes Digital Services and also promote it as a value-added service to top producing agents with whom they work. Strengthening the carrier-agent relationship provides an excellent experience to insureds and prospects. Contact us today for a free, no-obligation assessment of your website. We can show you how to use digital videos to help achieve your marketing deliverables. We look forward to hearing from you.